Taking you pet on a road trip can be a very enjoyable experience. As if preparing for a road trip for yourself or your family wasn’t a daunting enough task, now you have to prepare to bring the family pet along too? Don’t fear – a little preparation goes a long way, and can mean the difference between a safe, enjoyable journey for you and your furry (or not-so-furry) friend, or a stressful one. Pack everything your pet will need. Be sure to pack plenty of water and a water bowl, and don’t forget food, medications, and favorite toys and treats. If you have a dog, bring along chewable treats or toys that will keep them occupied for awhile, both in the car and at your destination. Depending on your destination and pet, you may want to bring a crate, exercise pen, or tether for confining your pet while you’re away. Make sure you consider the safety of yourself and your pet when travelling. Never leave your pet in a hot or cold car unattended, and plan to microchip your dog before you leave. At a minimum, make sure your pet’s tags are current. Look up emergency vets in the location(s) you’ll be travelling – as the old adage goes: better safe than sorry. Make sure to have a plan for how you’ll secure your pet in the car. A cage, crate, dog seat belt, or car barrier will do the trick. Your pet should not be able to get into your lap or under your feet during your journey. While dogs have an inherent love of sticking their heads out the window and taking in that fresh breeze, it’s incredibly dangerous, and we recommend you save the breeze for when you get out of the car. On the same note, don’t put your dog in the back of a pickup truck. More than 100,000 dogs die every year from falling out of a truck. If you have to make a sudden stop or swerve, or if Sparky wants to visit another dog, you may have a recipe for disaster. Make sure to stop regularly and offer your pet water and food, and if man’s best friend is your co-pilot, make sure you give him an opportunity to stretch his legs and go potty. Scheduling regular stops in may even give you an opportunity to explore sights along your route. Not all dogs love going for a ride. Be prepared that your dog may get car sick or have incredible anxiety about getting in the car. Make sure you do a few test drives to see how your pet does, and make adjustments that work for both of you. A few small treats and lots of praise can go a long way. 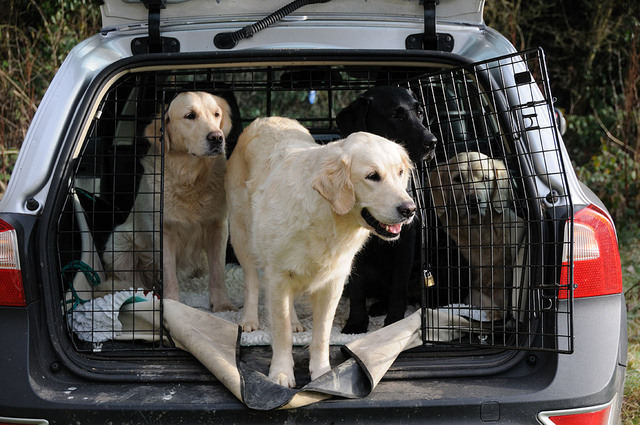 Follow these simple tips for road trips with your pets, and you might just enjoy the company! For more safety tips and tricks, visit the ASPCA website.